The Indiana University Martial Arts Program is the home of the largest academic Martial Arts program in the United States. 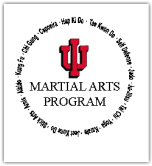 In addition to supporting non-credit martial arts clubs in many different systems, the academic program at Indiana University offers martial arts training for college credit through the Department of Kinesiology in the School of Health, Physical Education and Recreation. Martial Arts Coordinator Patrick Kelly runs a well balanced traditional, modern, hybrid and healing martial arts program at IU. While at Indiana University I had many great instructors. Those listed below are those that had a heavy influence on my martial arts journey and training. 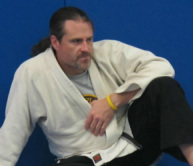 Mr. Bhat was just taking over the Academic Brazilian Jiu-Jitsu classes at IU when I arrived. I had no idea what Brazilian Jiu-Jitsu was but using my keen intellect had assumed it was similar to Japanese Jiu-Jitsu....Kedar opened my eyes to the art when he pulled his assistant into his 'guard' for the first time!! Kedar was not only an excellent instructor to me, but a good friend. Living with him for 2 years gave me a deep insight into the mind of an Indian BJJ teacher from Fort Wayne IN. My favorite memory (martial arts memory....there are many others!) was training in BJJ club and watching all the big muscle bound wrestlers wanting to roll with him. After 2 hours of club training he would often roll with 7-8 students most of which outweighed him by 50lb's or more, he would rarely break sweat as he demonstrated one of the core principles of BJJ in using leverage and his opponents strength and movement against them. Mr. Sieg was my first Hapkido instructor at IU, after taking a class in BJJ i wanted to delve into another standup art since that was my main background so far. The IU program has huge Hapkido and Taekwondo programs and the self defense aspect of the Hapkido really interested me. After looking at the curriculum for the beginning class, I drummed up enough courage to ask Mr. Sieg (then instructor of the intermediate class) to skip beginning and go straight to intermediate. He graciously allowed me and my Hapkido training begun. I moved fast through the early stages of the system and credit my ability to test for Yellow, Orange and green belt tests in that first semester to Mr. Sieg's excellent instruction. I believe I first met Mr. Kelly in Hapkido Club practices early 2003. I was immediately drawn in, as probably thousands of students before and after me have also been, to his intense and keen martial arts persona. He lives and breathes Martial arts, Coffee and Biking (in that order!). The experiences and stories I could talk about here are unfathomed but without question it was Mr. Kelly put me on my true martial arts path and I am still traveling along it. He made me a thinking martial artist, taught me how to analyze techniques and couple various martial arts together to produce a my own system that is to this day unrefined, evolving and non codified. He is my instructor, my mentor and my close friend. To learn more about Patrick Kelly click here for his Bio. Master Burns is a legend. For forty years he developed the IU Martial Arts Program and made it was it is today, the largest academic program in the country. He has touched the lives of thousands of students in such positive ways and I truly look up to him as someone who has influenced my life significantly. My favorite memory is being held in a 1/4 turn lock to the point of me tapping pretty ardently, then holding it there for several minutes while he explained to the class how the angle is so important! I also have fond memories of his office in HPER, it was a treasure trove of martial arts history and memorabilia and I found myself sitting in there soaking it all in many a time while I was at IU. To learn more about Master Burns click here for his Bio. I first met Jason during my exploratory time at Indiana, I had discovered that due to my assistantship I could take any of the Martial Arts classes for free! So I jumped into those that I knew first then delved into the arts I had never heard of. After taking Patrick Kelly's Intro to Stick Arts class a couple of times, I felt confident enough with a stick to take the Modern Arnis class. What a difference and what an amazing art, Jason truly opened my eyes to a totally different way of training. Rather than performing set drills and sequences, this art shows you how to flow with your partner in "Tapi-Tapi" being able to feel where the openings are and take advantage of them for your offense. I would compare it to chi sau or hubud training in Chinese and other FMA arts. It is based strongly on feeling the energy of your opponent,I remember fondly playing Tapi Tapi with Jason and his sly smile as he 'educated' me on the ways of Modern Arnis!